For February 2014 Memory Walks (One Day and Two Months After), I am exploring how my memory of my daily walk changes over a two month period. 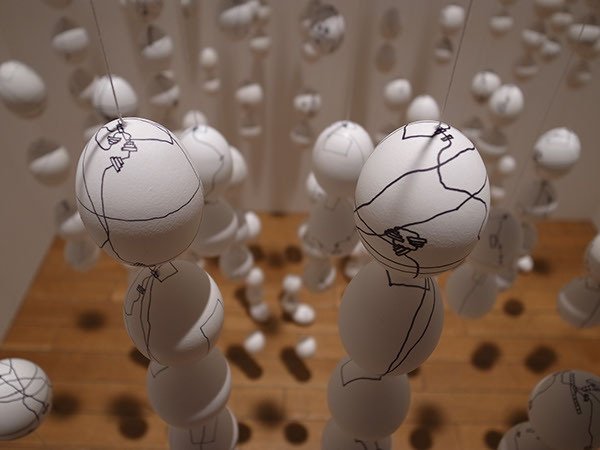 This installation was created for the Spiral Independent Creators Festival 15 (SICF 15) in Tokyo, Japan. SICF is an annual four day art/design festival featuring the work of 100 creators from all genres of creativity. 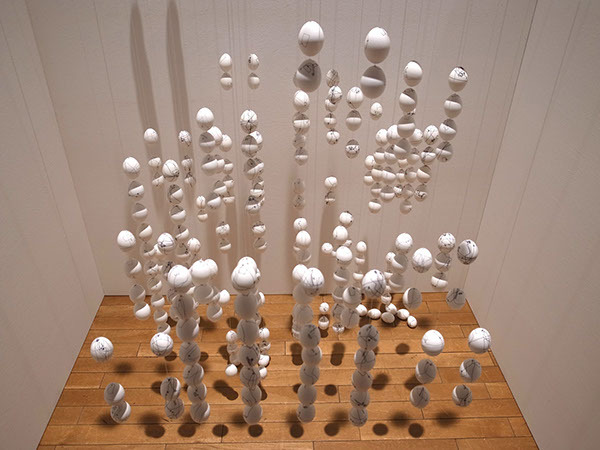 As with my previous Memory Walks project, each eggshell drawing represents a walk that I took during the month of February 2014. For example, going from my apartment to the train station, or going from the train station to the bus stop, or going from work to the supermarket. 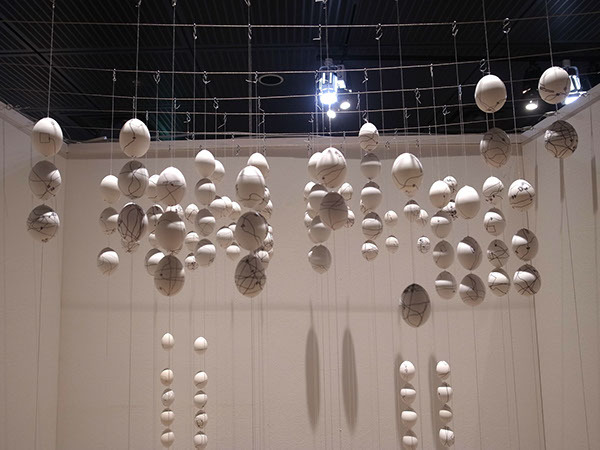 For this project, I have installed two string of eggshells for each day of February 2014. For each day, the left hand string of eggshells is my drawing of each walk the day after they were taken. 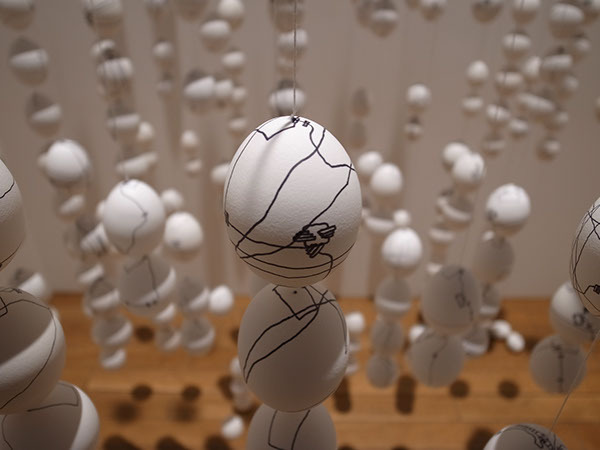 The right hand string of eggshells is my drawing of each walk two months after they were taken. Again, the location of each egg is the approximate time in which I took that particular walk with time going from top to bottom. 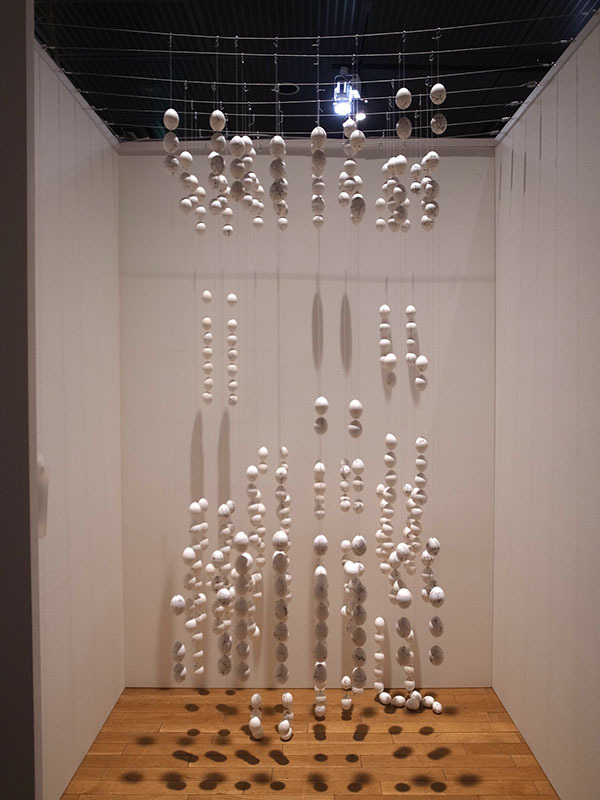 The pairs of eggshell string for this project are installed in a grid of 7 rows and 4 columns. February 1st in located in the back left corner of the booth, February 2nd is to the right of that, and so on until February 28th in the front right corner of the booth. For February 2014 Memory Walks (One Day and Two Months After), I am exploring how my memory of my daily walk changes over a two month period. 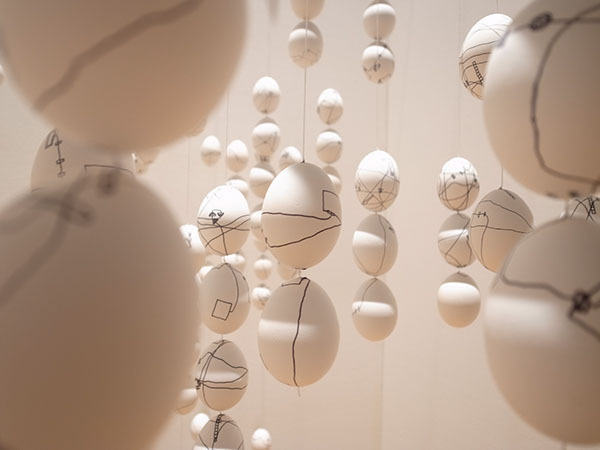 As with my previous Memory Walks project, each eggshell drawing represents a walk that I took during the month of February 2014. For example, going from my apartment to the train station, or going from the train station to the bus stop, or going from work to the supermarket.